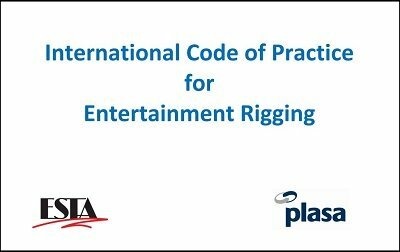 In response to calls from the international entertainment rigging community, rigging professionals from around the globe came together to create ICOPER to promote awareness and safety worldwide. This is a model code of practice with a focus on arena rigging, however it’s also applicable to all event production rigging disciplines. The principal authors of the Code are Nick Barnfield (New Zealand), Tiny Good (Australia), Chris Higgs (United Kingdom) Ed Kish (United States), Bill Sapsis (United States), and Roy Schilderman (The Netherlands). – If you wish to be notified when there are updates to the document click here. – For information about translations of ICOPER click here. – To see a list of organisations that have endorsed ICOPER click here. Understand the safe use of long link chain in rigging applications without contravening the EU Machinery Directive (in which the use of short link chain is only permissible for lifting purposes). The Code of Practice has been created in association with the Health and Safety Executive (HSE), the Production Services Association (PSA), the Lifting Engineers and Equipment Association (LEEA), and Total Solutions Ltd. The flight case ‘aid memoir’ can be used when out on tour as a reminder on how to use long link chain in accordance with the agreed safe use.